Tatsunoko Production Co., Ltd. (but generally referred to as Tatsunoko Pro.note タツノコプロ) is one of the notable and famous Japanese animation studios back during the Golden Age of Anime. Founded in October 19, 1962 by one of the animation pioneers Tatsuo Yoshida along with his brothers Kenji and Toyoharu, the studio began to produce anime occupying various genres. 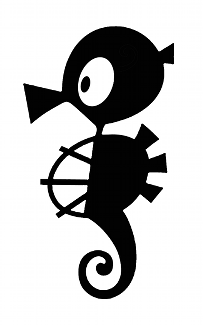 The name Tatsunoko even has a double meaning, with tatsu no ko meaning Tatsu's Child (as in Tatsuo's child) and tatsunoko meaning sea-dragon (which is generally referred to a seahorse), hence the logo. Over the years, Tatsunoko Pro. has produced many anime, including Yatterman and Honeybee Hutch. They generally produced a lot of stuff during the 70's and 80's, and slowed down during the 90's, in which they focused more on remakes and co-worked with other studios and animated shows for other companies. Around 2005, they were bought by Takara and became a full subsidiary when Takara merged with TOMY. They have also worked on a few western cartoons. Tatsunoko Pro. is notable for starting the career of Yoshitaka Amano, who did the character design of Science Ninja Team Gatchaman, Tekkaman the Space Knight, Neo Human Casshern (original version), Hurricane Polymar, and nearly all of the Time Bokan series. Many of their employees have gone on to found other Japanese animation studios of today including (but not limited to) Studio Pierrot, JC Staff, Production Reednote and Actas, Kino Production, Radix, A-Line, P. A. Works, Artmic, Design Office MECHAMAN, Studio Easter and Production I.Gnote and both Bee Train and Xebec, though that extent. They are also known for making many of the dubbed anime which were thought as cartoons back then in the US - Speed Racer, Super Dimension Fortress Macross, Samurai Pizza Cats, Gatchaman, and probably even more. The studio is currently animating the new Beyblade anime as well as the movie of Hutch the Honeybee. Recently they just released a Live-Action Adaptation of Yatterman helmed by cult director Takashi Miike, which like The Great Yokai War was aimed at younger audience than most of his movies and became a great success. They have also faced renewed appreciation in the west due to the appearance of Tatsunoko vs. Capcom on the Wii, first only to Japan, and then, with the Updated Re-release appearing everywhere. In 2013, they signed a deal with Sentai Filmworks to have eleven of their shows released in the USA. Go visit their Japanese or English sites for full listing of their works. Check out their entry in The Other Wiki too. A near complete list of their credits can be seen on Anime News Network . Adventures of Sonic the Hedgehog (Animation Cooperation for TMS, uncredited, staff behind the episode will later go on to find Actas)List "Quest For The Chaos Emeralds Part 3", aka "Robotnik's Pyramid Scheme"
Animaniacs (Animation Cooperation for TMS, uncredited, staff behind the episode will later go on to find Actas)List "Taming of The Screwy"
Japan Animator Expo (In-Between Animation)List "Nishiogikubo", "Three Fallen Witnesses", "Bureau of Proto Society", "Ragnarok"